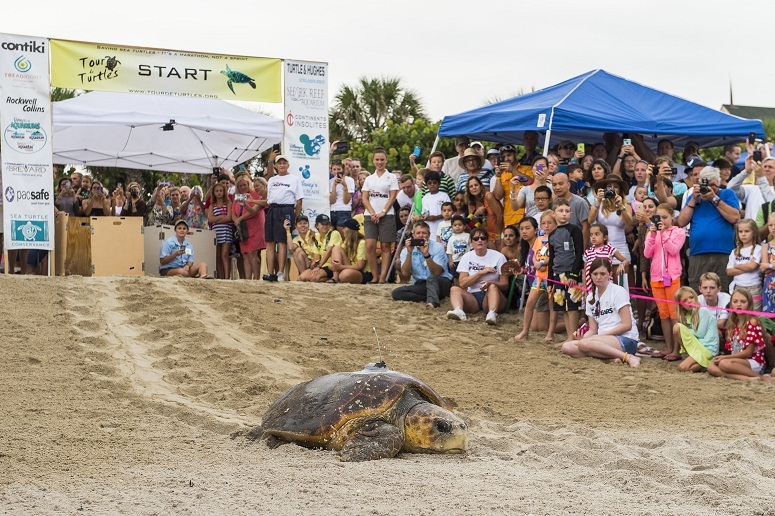 On August 1, 2015, researchers from the Sea Turtle Conservancy and Disney’s Animal Programs at Disney’s Vero Beach Resort attached satellite transmitters to the shells of two loggerhead sea turtles (named Tinkerbell and Marina) and released them back into the ocean as part of the annual "Tour de Turtles" migration marathon. Guests were invited to cheer on the sea turtles in a grand send-off and enjoy family friendly activities centered around saving the species. The goal of Tour de Turtles is to raise greater awareness about the importance of sea turtle conservation and for researchers to gain a better understanding of sea turtle habits and migratory patterns that may hold the key to their survival. During the summer sea turtle nesting season, from approximately May to October, the Disney’s Animal Programs team marks and closely monitors sea turtle nests within a 5-mile beach stretch of Disney’s Vero Beach Resort. Disney Vacation Club Members and Guests staying at the resort during this time also have the opportunity to join the Disney’s Animal Programs team on turtle conservation outings to observe the sea turtles and learn ways they can get involved. Guests can also adopt a sea turtle nest with the proceeds going toward conservation efforts in Florida through the Disney Conservation Fund (DCF). Since its inception, the DCF has directed more than $1.2 million to sea turtle conservation efforts around the world. This is the 8th year Disney has sponsored the event. Visit www.tourdeturtles.org for more information. PHOTO: ©2015 Disney. All Rights Reserved.